and brief; is to rise up and be glorious, and then vanish. I thought of these lines while reading Michael Cunningham’s new book, By Nightfall, a novel about the challenges of finding—and holding on to—beauty, and about the importance of resisting death; a force that beautiful people seem drawn to and beautiful things resist. In the book’s opening scene, 44-year-old Peter Harris and his wife, Rebecca, are marooned in a cab in the Manhattan night. They are on their way uptown to a chic art-world party, but their progress has been slowed by a very New York accident: a white Mercedes has collided with a carriage horse, snarling up traffic. And so, the novel begins in the slightly freakish presence of death and, when a homeless man is likened to “stately, plump Buck Mulligan,” in the shadow of James Joyce’s Ulysses. Fear not, though, this is no Ulysses. 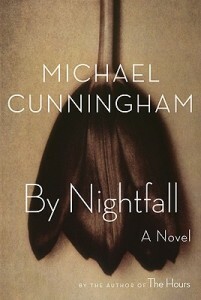 There’s nothing confusing about Cunningham’s propulsive prose; the references are occasional and inessential, the stylistic borrowings limited to occasional parenthetical asides and discursive interior monologues. Still, Cunningham’s New York is as intensely wrought as Joyce’s Dublin; it is a crowded, haunted city that contains both people who are truly exceptional and people whose job is to enable or to judge who is worthy of that description. Peter stands at the crossroads of life. Married for nearly 22 years, a gallery owner for 15, he is starting to feel “a small sense of disappointment, a hint of actual defeat.” He is approaching a point where he might have to accept that his potential has expired. His comfortable routine is jolted when Rebecca’s much younger brother, Ethan, comes to stay. Known in the family as “Mizzy,” the mistake, he is a beautiful, charming 23-year-old who was once an impossibly promising child and is now a restless young man with a drug problem. Ethan’s arrival unsettles Peter, leading him to question everything. It begins with his relationship to beauty. As a taste-maker, Peter’s job is to find new artistic talents and to promote their work—for the sake of his reputation and his bank balance, he must distinguish the truly remarkable and lasting from the fleeting also-rans. “He’s the servant of beauty, he’s not beauty itself,” Cunningham writes. But when Ethan moves into the loft, Peter seems to lose his sense of certainty about art and success and perhaps even about his own sexuality. Mizzy stirs memories of Peter’s brother Matthew, another dazzlingly special boy, who died too young, succumbing to AIDS 25 years ago, along with his lover and all of his friends. In Peter’s memory, “Matthew was (okay, maybe he was) handsomer and smarter and more gifted than any of them; Matthew whose comeliness and grace not only didn’t save him but (horrible thought) helped to annihilate him.” Is it this loss that drives Peter to “help, if he can, in the procreation of something marvelous, something that will endure, something that will tell the world … that we mattered not only in what we left behind but in our proud if perishable flesh”? But the piece, an odd marriage of ancient and modern, fits beautifully in the garden, leaving a sense that despite all the upheaval, things might just work out for Peter. June Thomas is the foreign editor at Slate magazine. She has worked at feminist bookstores, publishers, and magazines.